"I didn't get much sleep last night," is a sentiment that has turned into a mantra from Baltimore residents today. Everyone is saying it. Unless, of course, they're saying, "I didn't get any sleep last night." Those living in West Baltimore and surrounding areas where protests in response to the death of Freddie Gray galvanized to a point that fires were set to vehicles and buildings, could literally smell their city burning. Residents' evenings became a cacophony of sirens, screams, and glasses breaking as small businesses were destroyed and looted. As a citizen of Baltimore City living in a neighborhood that was a safe enough distance away from the protests and violence, I sat in bed as sirens and whirring helicopter rotors served as a macabre soundtrack to my entire night and early morning. The calamity caused by the incidents catalyzed national coverage of my city, with scenes of looters, flames, and destruction playing out unremittingly on my television screen and news feeds. Being in the city, we know there are more peaceful demonstrators and non-violent protestors in Baltimore right now than there are people taking a more destructive approach to expressing their outrage at the death of Freddie Gray, and the history of police killings in general. We know there are more quiet, peaceful protests than anything, but that's not what you actually hear in the city right now, and it's certainly not what the rest of the country is seeing on their TVs. "I feel guilty ... I feel stupid knowing that the stress I've felt for the city is only a fraction of what our impoverished residents who live in drug ran and police occupied neighborhoods feel everyday. You know when you say 'that's a sketchy/bad area?' People live there. People who have good reason to fear the police; fear that's realized in cases like Freddie Gray's. I can't imagine living that way; I don't want people to have to live that way. We need a serious change and we need to pay more attention." "I was born and raised in Baltimore. ... I teach in a K-8 school in Baltimore, two blocks from North Avenue. My school is located on Collington Ave., mere blocks from the building that was burned down on Gay Street last night. I teach 7th and 8th graders - none of whom are white. ... Watching the city riot and burn Saturday and last night was disheartening. Rioting, looting, and blatant violence can not be accepted. While I do not put much credence into those as being acts of anger due to systematic racism, we should all acknowledge that many people in our city are oppressed. Back to the point, last night I immediately was concerned for my students. I was afraid that the school would catch fire, as well as neighboring houses, due to the embers of the building that was ablaze. I know I will have a talk again with my students, but hopefully they will all be in class... and not in a holding cell." "I live in Fells Point. Before it got dark, a few stores boarded up preparing and we exchanged numbers in case anyone saw anything. [The rioters] broke into the convenience store by my house. There's a broken police shield on the corner. It's silent. No one is on the street walking. You could hear sirens all night. It's so heartbreaking. I love my city, I love my neighborhood." "I'm actually outside of the city about 10-15 minutes so my neighborhood was OK and virtually unaffected last night. I do have so many friends living in and around the city, or friends who have to go into the city for work, and I can tell you that its tense here. There are police officers scattered everywhere, national guard trucks driving around. They're trying to ensure what happened last night won't happen again. It's sad though. So many businesses are close today. Balt city schools are closed today. "That CVS that was looted and caught on fire was probably the honey pot that community. 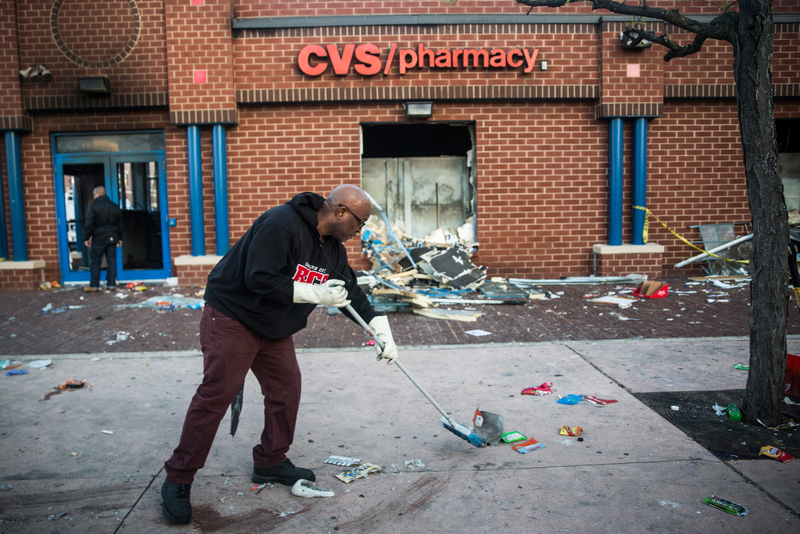 Everyone needed that CVS pharmacy and after working so hard to get it into that neighborhood, its own neighbors destroy it. It's sad. I think people have totally lost sight of what this whole thing is about. Rioters are no longer concerned with Freddie Gray. They're concerned with nothing other than destruction and causing mayhem. No regard for consequences or aftermath." "We are staying at the Sheraton near the Inner Harbor. We went to the Inner Harbor for lunch yesterday, where everything was normal. When we tried to return for dinner, everything was shut down and there were riot police on two sides of the Harbor. We were told by the police to return to our hotel. We had to have dinner there. Today all the schools and public buildings are closed." Myself and other Baltimore residents are mourning the tragedy that erupted from something that we all watched begin as a group of citizens seeking justice and peace for Freddie Gray, a Baltimore citizen who died as a result of a spinal cord injury while in police custody. Monday was Gray's funeral, and as Gray's family and friends laid him to rest, they became unwittingly privy to the attempted dismantling of parts of the city they call home. Gray's family spoke out against the violence that occurred. "I want y'all to get justice for my son, but don't do it like this here," Gray's mother, Gloria Darden, stated, while Gray's twin sister, Fredericka added, "I don't think that's for Freddie ... I think the violence is wrong." Scores of Baltimore residents watched what began as a peaceful protest—one that was formed as a way of seeking justice and prompting dialogue on issues that have long peppered themselves into the lives and fabric of a city that I and others continue to hold close to our hearts, and as a place we are proud to call home. I cannot tell exactly who was responsible for making the tide turn toward the route of violence, but the wide-held belief of myself and other citizens is that it was not those who were in any way a part of the original protests, or those who took to the streets in dedication to Gray. For anyone who wonders what it is like to live in Baltimore, the incidents that occurred yesterday do not characterize the city, nor is each day played out like an episode of The Wire, which is, for whatever reason, a question or statement I am a recipient of from many people who come here from another state or town. We have our problems In Baltimore. We are far from perfect (just like everyone and everywhere else), but we also offer a cohesive sense of community that is familial in a way I haven't seen anywhere else. I've watched friends move away, only to return because Baltimore was the one city that offered this intangible sense of home and family—not just by the people they are related to, but the entire community. Yes, we are all stricken by the events that have occurred, but through all the sadness and heavy-heartedness, we have also seen our Baltimore residents' impenetrable kindness and love for the city. While an initial — and completely understandable — reaction for many was to flee the city, throngs of citizens took to the streets armed with brooms and trash bags to aid in cleaning up the fractured parts of our city. No matter how we, the people of Baltimore, are experiencing these protests—whether it's recoiling at the sound of far-off sirens, or standing in the middle of the action—I think we can all agree on one thing: This city is a beautiful place, and hopefully these bursts of conflict can end so we can get about the work of solving the hurt and injustice that's driving them.